This is interesting – one of the few part numbers to have been reused, part 131 was a Dredger Bucket from 1921 for twenty years. It didn't make it back into production after the war, but the new Cam was introduced as part 131 in 1970. This page covers both parts. As with the Eccentric (part 130), the Dredger Bucket is first mentioned in the January 1921 Meccano Magazine as a reader's suggestion, but this time the response is that "we already have this in hand and hope to introduce one very shortly". In fact it took until July 1921, announced at the same time as the Eccentric, and with the next part number. The dredger bucket was dropped from outfits with the start of the numeric outfits 1-10 in 1937, and production was not restarted after the war, although it appears in the back of Meccano Manuals right up to 1952. In the March 1970 issue of Meccano Magazine, a new Cam was introduced, and surprisingly given the part number 131. The dredger bucket clips are shown in the picture to the right, one flattened out to help anyone who would like to make some replacements (they are very often missing). The clip is a simple piece of 31 gauge steel (0.30mm or 0.011'' thick), cut into a strip about 21.8mm (0.860'') x 3.35mm (0.132'') overall. The ends are rounded off, and the strip bent such that the end profile is approximately square, which makes the overall clip just under a centimetre long. I would suspect that any soft metal strip would do, perhaps cut from a tin can? These are painted after bending (from the examples I've seen), but before assembly on to the dredger bucket. 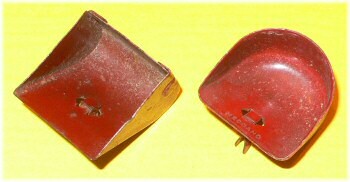 Initially nickel-plated, the dredger bucket was later produced in dark red. You will notice from the picture to the right that the slots for the clips are plain and straight on most of the nickel-plated versions. 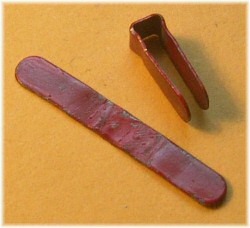 Later on, the slots changed to a shaped form, as shown to the right. I have no idea why. It looks at first glance as if these semicircular holes might hold or support parts of the sprocket chain, making the buckets more stable, but the holes aren't even remotely in the right place for this. The only other reason I can think of is that the punching tool could be made stronger if the hole was this shape rather than a thin slot. Has anyone else got any thoughts about this shape? Clive Weston tells me that both the plain-hole and the shaped-hole version appear in 1926 light red, which would date the change in design late 1926 or early 1927. However, we don't yet have an example of the second of these. 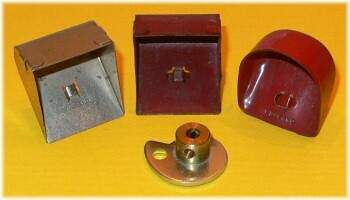 All examples of plain-hole dark red dredger buckets found to date appear to have been repainted over nickel plate. 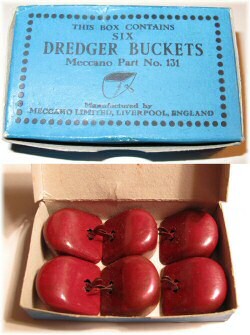 The major change came in January 1929, when a new design of dredger bucket was announced in the Meccano Magazine. Instead of a thin steel part folded into shape, this new bucket was stamped out of much thicker steel, with the same type of clip for attaching it to sprocket chain. A most interesting variation is shown in DMS/EMP as being "Red over gold" and dating from 1934 to 1937. The dates are definitely incorrect, but the report had a basis in reality: these are in fact painted red over brass dredger buckets. A magnet provides the answer! We don't have an easy way of dating these, but all examples found so far are dark red. Indeed, the paint appears to adhere to these parts better, and many people will find the dredger buckets they thought were in good condition are in fact brass ones. Dredger bucket in stamped brass, painted dark red. Use your magnet! I'm going to put forward a hypothesis that these are the earliest of the stamped-out dredger buckets. 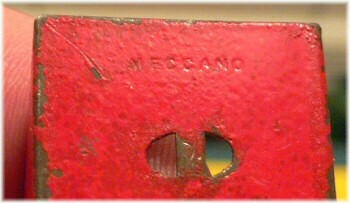 Perhaps Meccano thought that the deep stamping of one part would have to be made from brass, and only later on discovered that they did have the ability to stamp out the same shape from steel. Pure guesswork, but it does explain why the brass ones are all dark red, and gives a good reason for the change (making them from steel would be cheaper, of course). The Cam, introduced in 1970, appears to have been consistent (in zinc with a brass boss) from its introduction. A substantial number of cams are left-handed (i.e. they have the boss on the opposite side). I am defining the "correct" way around as per the example at the top of this page – with the boss upwards the 'cutout' section is at the top left. This is the version shown in the Meccano parts listings (from 1970 through to 1982). At the moment the counts are showing 'standard' cams as being about twice as common as 'left-handed' ones, or perhaps slightly more. The stamping can appear on either side, as can the sharp edges of the zinc plated part. This would seem to suggest that Meccano had two tools (or a two-hole tool), and produced the flat section both ways round, but they were mounted more often than not in the 'standard' direction. Perhaps they were intended to be like this for a period, and then later on (or earlier) were made randomly either way. Staffan Kjellin has sent me this picture of a light red folded dredger bucket, which I originally discounted as it looks like the part has been repainted over a nickel-plated original. This is the case, but what's odd about it is the holes. These are plain semicircles, without the side slots of later parts. Anyone got any idea where these fit in? Greg has helped us out again, with this lovely box of six dredger buckets, dating from probably 1929-1932 (stamped out shape, but still in dark red). This blue box style appears for many parts of this era, although mostly these are for single parts (Geared Roller Bearings, Digger Buckets, and most of the motors appear in these boxes). The parts listing of 1929 shows that the price of a dredger bucket changed from being shown as 2d each to 1/- for half a dozen. We can assume, therefore, that this box was the standard package of dredger buckets that could be bought from your local friendly Meccano dealer. A good investment for your original shilling! I have seen an old-looking brown cardboard holding nine dredger buckets, but I'm not as convinced that it's genuine as it is unlabelled. And below, Jaap has sent us an alternative box of six dredger buckets in a red box. This is similar to the spare parts box for the shuttle shown on page 104, and these red boxes are certainly less common than the blue ones. Are they earlier? Total number of messages on this page: 10. This is page 1 of 2. I have a few variants of dark red dredger buckets with a pair of holes spaced 0.5" apart ahead of the clip which would enable them to be screwed to a lifting arm instead of sprocket chain. the cams are also not left or right handed but made front to back or back to front by the person putting then in the die!! I have a set of 5 buckets ,nickel , but the "meccano" name is on either the back and the front . ?? !! presumably the plates were stamped withe the name then bent to shape either upside down or downside up!! I've got a pair of 1978 brass plated/iridescent cams somewhere, I think in their original packaging. Will attempt to locate.